Tune The Orchestra. It’s Time For Something…UPTEMPO The UPTEMPO Magazine focuses on the artistic collaboration of fashion and the performing arts. We execute the latest trends in fashion and the arts through artistic representation, journalism, event production, and creative collaboration. Stay tuned for more from UPTEMPO, the first creative outlet merging fashion with the performing and creative arts. 6 Dolce & Gabbana feature an opera-inspired collection during Milan Fashion Week! AN UPTEMPO REVOLUTION “Fashion Meets the Performing Arts” is featured boldly on the very first UPTEMPO cover. We emphasize this phrase in an effort to better serve the arts community, the fashion industry, and the dedicated followers who keep up with recent trends, styles, and news. Recent changes in the economic status of the United States Government forced officials to cut funding to the artistic and creative community first and foremost. Companies and organizations struggle to sell merchandise, fill seats, and even survive. It is the sole purpose and mission of UPTEMPO to better serve not only those who follow the fashion and art communities, but to serve the emerging talent who struggle to grow, develop, and blossom into true artists that express their creative talents. UPTEMPO not only serves as entertainment for the creative forces, but also assists in publicizing the fine work implemented by so many working industry professionals to the general public and those who might not regularly follow emerging artists. In this issue, The Overture, we introduce the unity of fashion & the arts through photography, event coverage, journalism, and more! Allow yourself to experience artistic harmony and allow UPTEMPO to open your eyes to various imaginative and inspiring art forms. During Milan Fashion Week 2009, Dolce & Gabbana paid a special tribute to opera with a collection featuring the face of Maria Callas and programs of past opera productions. The dynamic show took place at Venice’s Gran Teatro La Fenice. This is not the only time the duo featured opera. In June of 2010 they celebrated the 20th anniversary of their men’s line with an art exhibit in Milan’s piazza della Scala, and inside Milan’s City Hall, Palazzo Marino. The exhibit was of course accompanied by the music of Giuseppe Verdi. Fashionably Philly The Opera Company of Philadelphia took a bold step the season. Not only have they staged Gounodâ&#x20AC;&#x2122;s Romeo and Juliet as a battle between two 21st Century major fashion houses, but they also tasked fashion design students from local colleges to create high fashion, color-rich, avant-garde designs that would then be featured in a runway show within the opera! The production was full of glitz, glamour, paparazzi, and of courseâ&#x20AC;Ś operatic drama. Bravi tutti to a creative company! Every year, Boston Symphony Orchestra coordinates an event merging fashion design with classical music. Previous years included Project Mozart and Project Tchaikovsky, which led up to the biggest yet: Project Beethoven. Designers emulated his music, forms, instruments, and even his personal style through their work. Competition Winner Maria Canada poses with her design, while Patron Favorite Ashley Boiardi poses with hers. Other designers included Candice wu, Nicole Wzorek, Lauren Trump, Michele Pheanis, Kathryn McCuster, Yuki Kanai, Jessica Hutchings, and MJ Batson (not pictured). Above Photos: Boston Symphony Orchestra. London’s Royal Opera is sure they have the solution to fill the seats with younger backsides. That’s why they commissioned and produced a new performance based on the life of Anna Nicole Smith. While I won’t make any jokes at the expense of the dead, I trust the reader will take some time to think of a few. diverse cultures that are offered, its obvious; progression has been seized in almost every aspect, specifically technology. As I watch men and women walk around with Bluetooth in ear, reading the "Wall Street Journal" on their iPad, as they Skype conference calls, I can't help but be distracted by the technological growth taking place. While sitting in Starbucks, the lounge of any full-time employed American, surrounded by a sea of MacBooks, I notice how swift and relatively "new" technology has been embraced by practically everyone in some fashion. It becomes hard to ignore the business meeting nearby and just how much the men sitting near me have a shockingly good eye for putting a casual daytime-appropriate outfit together, which leads me to an under-appreciated conclusion; menâ&#x20AC;&#x2122;s fashion has become as advanced as current technology and just as widely welcomed. The foundation of the fashion industry has previously been highly focused on women, but it seems as though men are starting to actually have more fun with fashion in and out of the workplace, causing an intriguing fashion tug-of-war between the sexes. Stop to Shop & Trend Report With our new fashion contributor comes two new columns: our weekly “Stop to Shop” and “Trend Report” columns. Each week, we will bring the Uptempo readers the latest and greatest trends and fashions for the summer season. From crazy colors to lacy knits, we’ll translate the language of the runway (spoken by so few) and their trends to street styles and show readers accessible versions of our favorite collections, as outthere as they may seem. We must warn readers of the dangerous temptation they are likely to feel, known as trend overload. The overload of summer trends and options for every price point may cause readers to think they can mix any and all trends in any which way they please, resulting in a lacy, rainbow, platform-clad mess. One word of advice? Please dress responsibly. We all have one—that little boutique on the corner that is your one stop shop for absolutely everything. Or, perhaps, it is that one local shop that has those party frocks, jeweled clutches, and irresistible heels at amazing prices that you simply can’t find anywhere else. Whichever shop it is for you, everyone has that one favorite store in their city that seems to be an undiscovered gem, unknown to everyone else except for the one lucky shopper who seems to have discovered it and stops in every week. Beginning next issue, Uptempo will profile some of the chicest shops in cities around the country! From the little shops off the beaten path to the heart-stopping boutique on the main street of your local shopping mecca, we will bring you profiles and articles on the shops (and the forces behind them) that carry the pieces and prices that you need to know about in cities around the country. Interviews with the owners, history of the boutiques, local bestsellers and reader discounts will make you fall even deeper in love with your favorite shop (and Uptempo’s new column!). From New York to Boston and from L.A. to Chicago, we’ll find that special shop for everyone, no matter what your zip code is. Next week, we’ll kick off our column by profiling Crush Boutique in Boston, MA. If you would like to share your local shopping treasure trove with Uptempo, please e-mail the details, including the name, address, phone number, and website of the store to juliannem@theuptempomagazine.com, and we will consider it for a Stop to Shop profile. Check back soon for our first column. Happy shopping! -J.M. 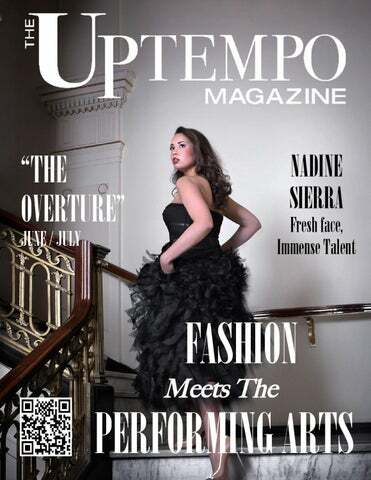 "Once upon a time you dressed so fine"
Opera star Nadine Sierra poses for Uptempoâ&#x20AC;&#x2122;s first cover and sits down with us to discuss her past, present, and future experiences in the opera field. In addition to winning the Metropolitan Opera National Council Auditions at an extremely young age, Nadine also received the Marilyn Horne Foundation Award, and has sung all over the world with companies such as Palm Beach Opera and Boston Lyric Opera. She will soon make premieres with San Francisco Opera, Florida Grand Opera, and La Scala in Milan. U: What has been your experience working with major companies and competitions at such a young age? NS: At this point in my life, my experience with major opera companies and competitions has been very rewarding. When I say rewarding, I don't mean in money or praise, but in how I'm able to do what I love with great houses and other working professionals. Being able to perform at this age is the greatest thing for me and having a supportive group of people behind me is invaluable. U: When did you know singing opera was what you wanted to do for the rest of your life? NS: When I was 10 years old, my mother introduced me to the 1992 VHS recording of the Metropolitan Opera's production of La Boheme. I was obsessed with this videotape and constantly watched it. I think I even cried every time I saw it, although I always knew what would happen in the end. It's hard to explain what affected me in words, but what I can say is I wanted to create that kind of magic on stage, as well. I wanted my singing to affect people the way Teresa Stratas affected me. I was hungry for this and still am. There is so much beauty and pain that goes into performing, because although you touch people's hearts with this glorious music, you also leave a part of you behind...especially when you give all of yourself to play a character. But that's the magic of it. One night you're dying in a bed with your lover trying to warm your hands beside you and the next morning, you're you again! U: Since winning the Metropolitan Opera National Council Auditions, how drastically has life changed? NS: My life has changed quite a lot since the Met Competition. I've been given more performance opportunities and have had many young singers contact me via FaceBook with various questions about colleges, teachers, competitions, etc. That competition opened many doors for me and I hope other opportunities present themselves in the near future. U: Where do you hope to be about 10 years from now? Is there anything you'd like to accomplish in addition to being a young, beautiful opera star? NS: In 10 years, I just hope to remain happy and singing! Traveling is something I love to do and if I could sing in some of the international houses that would be a dream come true. I always take one day at a time because we never know what may happen in our lives. I try to have no expectations, just goals and to be motivated every day. U: How did you like working with Uptempo for your first fashion shoot? NS: I adored every minute of it! I love fashion and being able to combine my two passions into one shoot really made my year. It's not every day you stand on a beautiful stage dressed in one of your favorite designers! U: How do you feel fashion plays an important role in the production of the performing arts? NS: Fashion IS performance! And it's an art! Fashion gives us the opportunity to express ourselves, no matter what our individual tastes may be. This includes being on stage AND off. Fashion adds to the drama on a stage and even adds a bit of drama in our average, every day lives. Long live fashion! The Other Side By: Kate Johnson Working hard and living by the philosophy “if it’s worth doing, it’s worth doing properly”, Kate Johnson loves the fast paced nature of the model industry and reflecting on her years spent living and working abroad developing her career. The Australian-based model opens up about today’s big issues: confidence and self-esteem. I had a chance to visit Lincoln Ristorante, a $20 million, 100+ seat restaurant operated by Patina Restaurant Group at Lincoln Center on my recent trip to NYC. The restaurant has only been opened a couple months and is headed by Jonathan Benno, the former chef de cuisine at Thomas Keller's Per Se for 5 years. The restaurant is housed inside a glass-enclosed pavilion, topped with a curved, sloping roof covered with grass and open to the public. Entering the building to meet the hostess on a rainy night, we were greeted with a coat check offering. Looking around, the interior of the restaurant has a sloping ceiling covered in dark wood. I got a sense that the place is modern and chic. The kitchen is open and occupies a central spot that we were able to see from our round booth we were seated in that also overlooked the steps of the Julliard School. The bread offered was red pepper flake bread sticks, which were crunchy with a slight heat and crisps dusted with parmigiano reggiano and pork fat. The crisps were addicting. There was a second bread service consisting of focaccia served with butter and Laudemio olive oil. I had to help myself to a second serving. We put together our own tasting menu selecting several items off the a la carte menu although there was a set tasting menu offered. We also relied on the sommelier to pair our food selections with wine and were not disappointed. All the wines on the wine list are Italian. Makeup artist Rosa Fortuna gets Dynasty Model Jennifer Kutt ready for her big walk! Behind The Scenes Tons of fun makeup! Grace Mahoney of Blushing Brides touches up Nadine Sierra for her photo shoot. Aerialist Gina DeFreitas gets ready for her outstanding aerial performance. Members of Boston Dance Company prepare for a special performance. Designers of Boston Symphony Orchestraâ&#x20AC;&#x2122;s Project Beethoven fashion competition enjoy watching their designs on the catwalk! Samantha Serrentino, Lauren Hagen, Morgaan Watrous, and Sharon Higgins. BLO Director of Artistic Operations Nicholas Russell and BLO PR Consultant Paysha Rhone. (right) Siobhan Magnus, American Idol Alumni, Top 5, Season 9. Omar Lorenzo and Maria Lorenzo. Debbie Black of Shreve, Crump & Low Jewelers. Ryan Pierce, Christina Pierce of Christina K. Pierce Sytling, Joseph Gualtiere, EIC of Uptempo. Rachel Zevita, American Idol Alumni, Top 24, Season 10 (current). Joshua Shinkle and Joseph Gualtiere. Yolanda Cellucci of Yolanda Enterprises, Inc. Designer Candice Wu with Dynasty Model Nomi Ganbold. NBCâ&#x20AC;&#x2122;s Gary Petrini (Uptempo logo designer & Joseph Gualtiere Sr.
(center) DJ Michael Savant and Jon Fabrizio. Architect Paulius Daunoras and FIT student Saskia Naidu. Fran de Paulo and Mariale Celimen Savino of Boston Dance Company. Conductor Kelby Kahn with BSO & Tanglewood singer Hailey Fuqua. Fashion Production and Stylist Kathy Benharris with The Uptempoâ&#x20AC;&#x2122;s Magazine Founder & EditorIn-Chief Joseph Gualtiere. Uptempoâ&#x20AC;&#x2122;s Joseph Gualtiere with Gina Gualtiere and Meagan Hubbard, both of Memorial Sloan-Kettering Cancer Center. Renee Delio and Frank Baldini. Yolanda Cellucci with Susan Haifleigh. Fashion Production & Styling team Erin Weathers, Kathy Benharris, & Sarah Turnage. Christina Pierce, Rita Bean, & Ryan Pierce. Joshua Shinkle, Joseph Gualtiere, Renee Delio, Frank Baldini. Model & Writer Amy Nachbar with Joshua Shinkle. Thomas Crewe and Lainya Anjoorian of Jimmy Choo, Gin Freeman of Dynasty Models, Marianna Toroyan of Fashion Doctors, and stylist Terri Mahn. Stylist Terri Mahn, Joe & Gin Freeman of Dynasty Models, and jewelry designer Magdalena Stokalska. Actor Juan Carlos Pinedo and Shaun McMahon.